The Shawn & Gwenn Vlog is Here! Next VLOG: Can You Get HIV From Sharing a Glass of Water? Here it is! Our first entry as Vloggers. Every Like, Comment or Subscription to our videos will help get more people to join in the discussion. We are just getting started, and we really hope you enjoy this new venture. 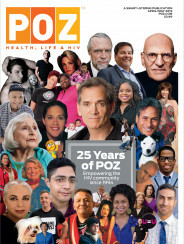 Please pass it along to the folks in your life who might benefit from hearing messages of hope and happiness from a couple that is living healthily with HIV as part of their relationship.